I am so excited about these books! Bookroo takes the guesswork out of which books to get for my toddler. The packaging is also super cute. I’m excited to share these stories with my son! Bookroo is seriously the best! We love boardbooks, but as a new mom I don’t always have the time to search and find new books for our little babe’s collection. Bookroo provides great books that I wouldn’t normally find. Also, each book is indivuallt wrapped with care which makes it all the more exciting when our package arrives! Absolutely love this subscription idea and attention to detail! The books coming wrapped is such a special touch and my daughter was so excited to open everything up. The books we received were wonderful and the art work was amazing. This is perfect for discovering new books and getting something other than toys. You can never have enough books if you ask me! Perfect gift for the holidays. The quality is impeccable and each book, individually wrapped as a gift is a real treat. Don't hesitate! My baby boy and I were so excited to receive our books from BookRoo and we were not disappointed. It was so great that each book was wrapped like a present! We love each book and have already read them several times. My boy is only 9 months, but loves to play with books and the books they selected were perfect for him! Thank you I will definitely be reordering from this company, loved my entire experience with them! Love this! 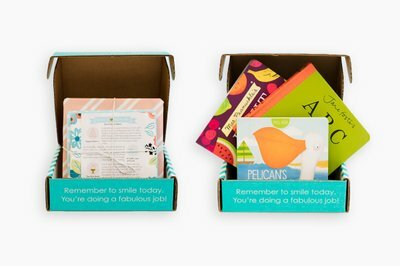 I bought a couple of subscriptions for my friends for their children after my kid loved it. The customer service is wonderful and I love seeing a package of literacy on my doorstep every month. We absolutely love bookroo! Our first package had three adorable books, which we have been reading on repeat. The packaging is pretty and the concept is wonderful. I cannot wait to build our library with this company!